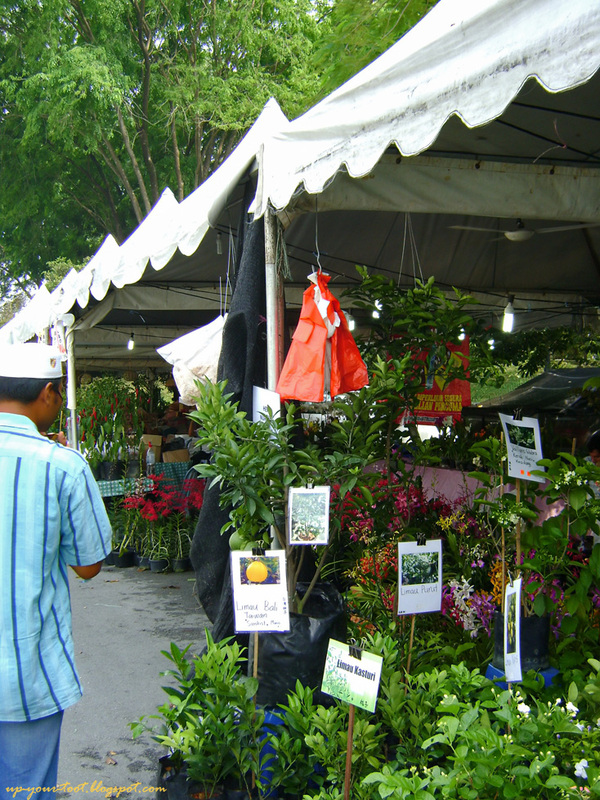 There is a Plant Fair at Shah Alam again. I was looking for parking to go to one of the shops near the lake and saw the row of stalls that had been set up that were selling plants and orchids. If you've been to the previous Shah Alam floral fest (Pesta Bunga Shah Alam), the stalls are in the same location, with almost the same sellers this time around. 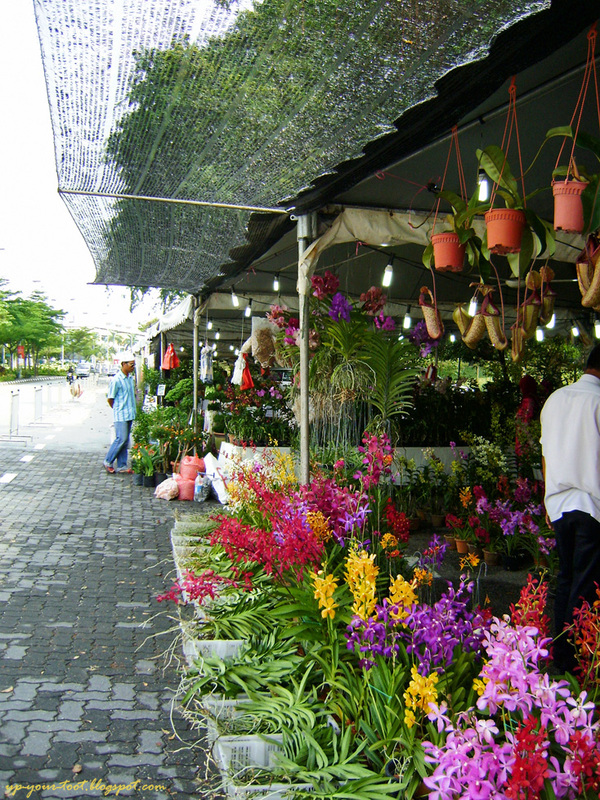 One of the stalls selling orchids and pitcher plants. After browsing through the stalls, I asked one of the stall workers how long would the stalls be opened there and the answer I got was one week, from 23rd March - 1st of April. So there will be ample time for garden enthusiast to get some plants. Fruit trees in polybags, many of which are already flowering or have fruits. One of the orchids sold by United Malaysian Orchid caught my eye. It was the Renantanda Gold Nugget. This hybrid is a Vanda spathulata look-alike. It is a primary hybrid between Renanthera storiei and Vanda spathulata registered by R.E.Warne in 1947. Renantanda Gold Nugget sold at one of the stalls. 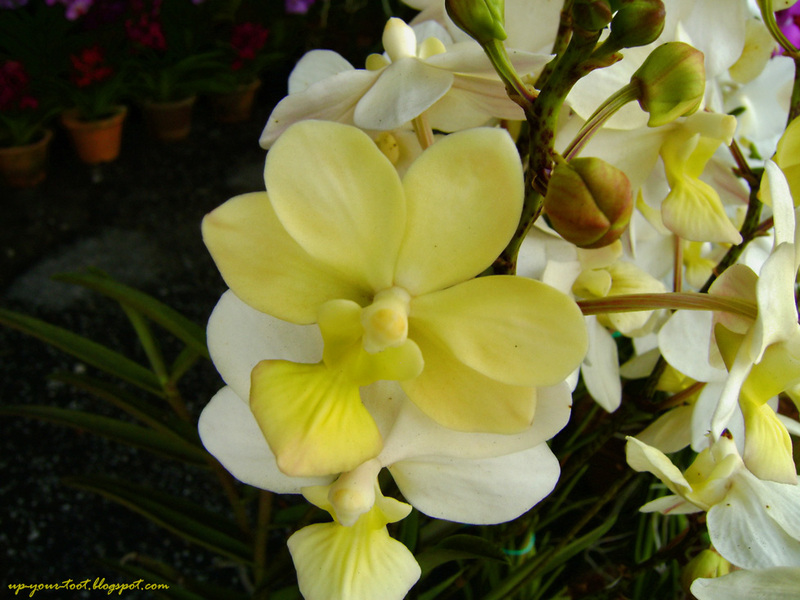 The flower looks like one of its parents, Vanda (Taprobanea) spathulata. The plant looks very much like a Vanda spathulata, save for the thinner stems, closer spaced and shorter leaves, plus reddish purple markings all over the stem, leaves and flower stalk that is typical of many Renanthera. The petals and lip is slightly different from V. spathulata, and the bud and pedicle is covered with reddish markings obviously inherited from the R. storiei. 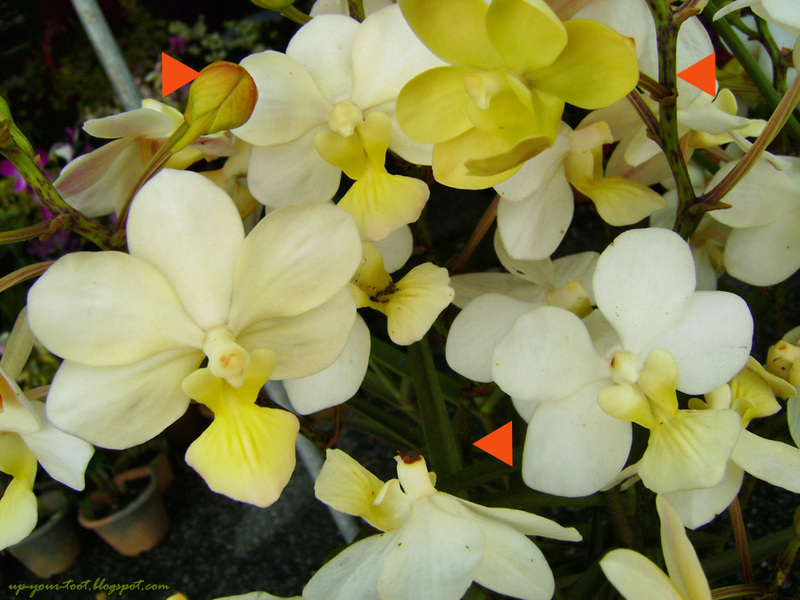 Orange arrows point to the reddish tinged buds and pedicle, the reddish spotted flower stalk and the narrower red flecked leaves and thinner stems of Renantanda Gold Nugget that is inherited from R. storiei. The flower shape and colour is dead on of V. spathulata. The reason this hybrid's similarity to V. spathulata is due to the ploidy state of the parent plant. V. spathulata is a hexaploid, whilst R. storiei is a diploid. So V. spathulata has three times more genetic influence than R. storiei. The resulting hybrid is a tetraploid, and R. storiei genes are only represented by a quarter of the total chromosomal material in Renantanda Gold Nugget, hence the likeness to V. spathulata. I have grown this plant before, but it was difficult for me to get it too bloom. This week is a busy week for garden/orchid enthusiast, for there is another exhibition in KL, namely the KL Bonsai and Orchid Exhibition 2012 at the KL Lake Gardens. I guess when it rains, it pours...and wallets gets emptied fast. I think the chromosome study for this plant is one that I would avoid...hehehe...warna-warni gerai macam nak raya. Haha, true, banyak sangat chromosome. Tulah, terkejut saya bila nampak gerai-gerai tu. But the city council did not advertise it.